Get Creative with Adobe and Win $10,000! That's right, you can win $10,000 just by opening up your copy of Adobe Create Suite 5.5. If you don't have a copy, you can download a free trial on the Adobe website or use your school's copy in the computer labs! Simply use your imagination and design something creative and enter it in the Adobe Imagination Challenge. The next deadline for your chance to win is this Saturday, October 15. 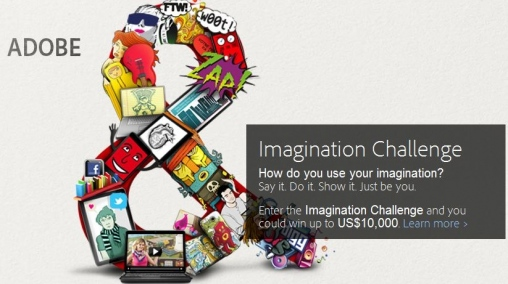 For more details about the contest and get your project started, visit the Adobe Imagination Challenge website. What are you waiting for? Nike Air Force One debut in 1982 and have been a major hit in the hip-hop community since then. Although the original purpose of Nike Air Force one is basketball, it is more like a shoe for urban style.Nike Air Force One was the first pair of Nike shoes to have a full length air sole. It has grown so much in popularity and has been released so many times with so many color combinations. In 2007, Nike Air Force One 07 was released to celebrate its 25th anniversary. Nowadays, Nike Air Force Shoes have become an icon of fashion and culture for its popularity off the court.